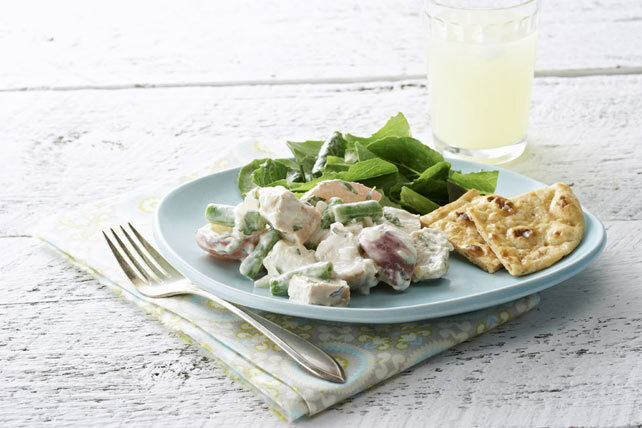 Chunks of tender chicken breast and fresh green beans give this potato salad its French bistro appeal. Combine first 3 ingredients in large bowl. Mix remaining ingredients. Add to potato mixture; mix lightly. Substitute 2-1/2 cups chopped rotisserie chicken for the chopped cooked fresh chicken breasts. Substitute fresh asparagus for the beans. To keep your picnic safe, be sure to follow the 2-hour rule. That means that no food should be left in the "danger zone" temperatures between 40°F and 140°F for more than 2 hours (or 1 hour if the outside temperature is above 90°F). Remember that the same rule applies to take-out food that is brought along on the picnic.